Thinking about buying a freestanding bath? Aside from size, style and material, you also have to choose from different taps for your bath. These stunning tubs are fantastic statement pieces for bathrooms, no wonder they have grown so popular. It could be quite challenging to think of a tap that will go well with your freestanding bath. Because of its style, many first time buyers ask where the taps go and how the plumbing is done. The following are your choices of taps. Your choice depends on your bath’s location or how much you are willing to spend. Freestanding bath taps are designed with the freestanding bath in mind. As the name implies, they also stand on their own. Since the tap is not attached to anything, you can freely place it anywhere, like your bath. The problem here is that you still need to extend the plumbing in order to fit into the tap in case you want it to be different from the existing plumbing. Extending may cost you more but still, you can go for this option if you will be happy with the results. Deck mounted taps are attached to the bath, with holes drilled into it. You can only use this if there is enough space at the edge of your bath, so it is best to check the dimensions before deciding to choose this kind of tap. This is a good choice for superior floor space and if you cannot use a built-in valve. You have different styles and configurations that will suit your bath, or even go for one that can be used with a bath overflow waste system. Wall mounted taps, as the name implies, are mounted on the wall. 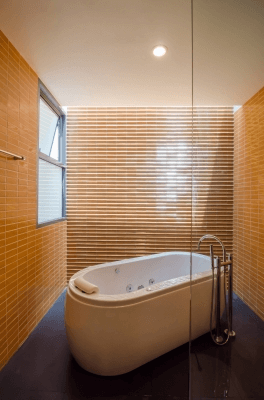 In this case, you need to place your bath close to the wall so that the tap can reach. You can go for taps with longer spouts so you can also place the bath slightly away from the wall. The advantage is that pipework can be hidden in the wall, making it a good choice for a minimalist option. If you want a modern and stylish bath, you can opt for a waterfall type of spout for your wall mounted filler. This would require a valve in the wall. Alternative fillers include overflow and bottom filling waste fillers. Both are sleek choices for a freestanding bath. Overflow fillers fill the bath but come with an overflow to stop the water. Water comes from a hole underneath the overflow and is controlled by deck valves on the bath or a thermostatic valve on the wall. Latest advancements allow freestanding baths to be filled from the bottom up using bottom filling waste fillers. These can be controlled manually, with hot or cold or thermostatic valves. Innovative products allow you to silently fill your bath. A separate valve is needed to bring the mixed water to the waste filler. These options offer stylish ways to design your bathroom.